This chair might not be all that to look at but man, it's comfy. I don't remember seeing that. Is that your living room now? You've been very busy if so! Yes, that's the living room. You wouldn't have seen it, it got covered up with stuff in the first load. Wow, you managed to unearth it! Did we move that chair, or is it new? 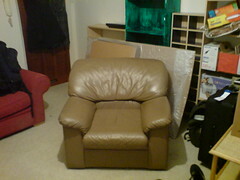 I know we moved a lot of stuff, but I don't think I would forget a chair. It was in the flat. We covered it up with stuff almost immediately.